Coumadin, or warfarin, is a drug used to treat blood clots. Coumadin can be a life-saving medication for people who have blood clots near their lungs or heart, but taking the medication may lead to unpleasant side effects. Side effects can include flu-like symptoms, itching, chest pain, yellowing of the eyes or skin, numbness, prickling, or burning of the skin, fever, skin ulcers and purple spots developing on the skin, which may signal necrosis, or death of skin in that area. Hair loss is also possible when taking Coumadin. Talk to your doctor to determine if hair loss could be the result of an illness. Autoimmune diseases, diabetes and poor nutrition can all cause hair loss. If the hair loss persists or worsens, you may wish to contact a dermatologist. Also, depending on the reason for taking warfarin, an alternative therapy may be possible. For some conditions aspirin and/or other antiplatelet medications may be appropriate and for others low molecular weight heparin, which is administered as an injection under the skin, may be appropriate. Using vitamins as part of a natural approach to treating hair loss can be a healthier method to use as long as you are informed about what you are using. In large doses, even many types of vitamins or natural supplements can be harmful or even fatal. However if used correctly, methods using vitamin A for hair loss treatments may be healthier than those containing chemicals. These chemicals may lead to side effects. Being informed of more natural options is a way to avoid taking treatments with chemicals. Vitamin A describes a group of five similar compounds. The most popular members of the vitamin group are retinol and beta carotene. Others are carotenoid compounds. Vitamin A occurs as retinol in animals. Actually, it is found as its ester, retinol palmitate. It is a yellow, fat-soluble compound which is converted to retinol in the intestine before storage. The stored retinol is then converted to retinal, a compound that absorbs light and is essential in the eyes for color vision and seeing in low light. The other Vitamin A compounds including beta carotene, alpha carotene, gamma carotene and beta cryptoxanthin are derived from plants. They are converted to retinal in omnivores and herbivores but not in carnivores. Retinol is the most potent form of Vitamin A, therefore, plants are not recommended to serve as the sole source of the vitamin. In fact, Vitamin A supplements and foods fortified in Vitamin A provide more of the vitamin than most plant-based sources. The recommended daily intake values of Vitamin A vary with age. Children need between 300 and 500 micrograms per day while adolescents and adults should take between 600 and 900 micrograms of the vitamin per day. Pregnant mothers are advised to take 770 micrograms per day and breastfeeding mothers should ingest 1300 micrograms of Vitamin A daily. Vitamin A is essential to quite a number of biochemical processes in the body. It is known to be central to vision through its interaction with the rods and cones of the eyes. The vitamin is also known to the important to gene transcription and expression, a healthy immune system, development of human embryos and production of red blood cells. Vitamin A also contributes to skin health and has antioxidant properties. Vitamin A can be found abundantly in the following food sources: animal livers, butter, carrot, spinach, broccoli, cheese, mango, milk and egg. There are two kinds of Vitamin A deficiency: primary and secondary. In primary Vitamin A deficiency, the individual does not ingest the recommended daily amount of the vitamin either from plant or animal sources. Secondary deficiency occurs when certain factors including zinc deficiency, smoking and alcoholism affect the optimal absorption of the vitamin from the intestine. Both forms of Vitamin A deficiency produce the same outcomes. Signs of deficiency in the vitamin include impaired vision, night blindness, dryness of the mucosal membranes of the eyes, respiratory tract, and urinary bladder leading to conjunctivitis, total blindness, respiratory and urinary complications. Vitamin A deficiency also produces an impaired immune system and the formation of white lumps in hair follicles. This later sign quickly leads to hair loss. On the other hand, too much supplementation of Vitamin A can lead to toxicity. Since Vitamin A is a fat-soluble vitamin, it is not as easy to eliminate from the body as the water-soluble vitamins. Acute toxicity is seen when the level of Vitamin A in the body reaches 25,000 IU per kg. This can be reached by consuming about 4,000 IU of the vitamin every day for at least 6 months. This toxicity can lead to renal failure and liver damages. Signs of Vitamin A toxicity include nausea, anorexia, vomiting, irritability, blurry vision, headaches, body pains, lethargy and hair loss. Just as for its deficiency, Vitamin A toxicity shares certain common signs such as dryness of the mucous membranes, poor skin health and hair loss. Therefore, supplementation with the vitamin for the treatment of alopecia should be carefully monitored, and high doses should not be taken for long-term therapies. The antioxidant properties of Vitamin A are especially useful for the protection of hair follicle cells. Circulating free radicals damage cells easily and accelerate the process of aging. Vitamin A can mop up these reactive radicals and prevent them from damaging the cells of the hair follicles. Similarly, Vitamin A supplementation prevents dryness of the scalp and wilting of the hair pores. This also contributes to the prevention of hair loss because a well-oiled skin signifies a well-nourished skin. In this way, hair shafts are healthier and the hair appears lush and full. Since Vitamin A supplementation requires a fine balance in order not to worsen hair loss, the recommended dosage of the vitamin in the treatment of alopecia is usually between 5,000 and 25,000 IU per day. 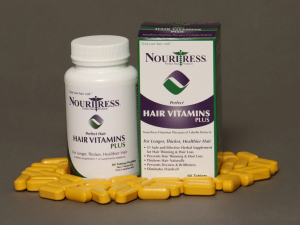 Before deciding on what hair loss vitamins, herbs or other supplements you want to add to your daily regimen to try to prevent and reverse hair loss, you should know what exactly you are taking and what it can do. Vitamin A is good for overall health, especially hair and nails. 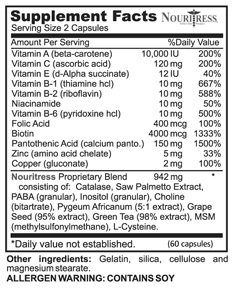 This can be taken alone or as part of a multivitamin. Users should also be aware, however, that too much Vitamin A can actually result in the loss of hair. 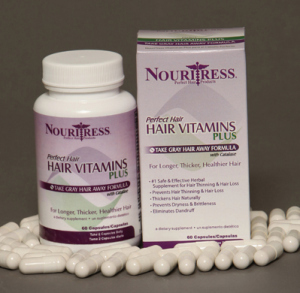 It is important when using a vitamin A hair loss method to have a healthy balance of this vitamin. It is a good idea to have a good, healthy natural balance of vitamins and nutrients either through your diet or by using supplements. This can help the body to be balanced and enable it to correct imbalances naturally. Many who use vitamin A for hair loss see results and there are other benefits like healthier skin, as well. Vitamin A is a key player in stimulating healthy growth in hair, skin and nails, and in fact, helps regulate certain aspects of the hair follicle. This in turn helps grow stronger, healthier hair as well as retain the hair already present. Vitamin A is an anti-oxidant and anti-oxidants are known for their ability to promote healthy blood circulation. Healthy circulation improves the hair follicles ability to function which is crucial to avoiding hair loss. Vitamin A can be taken as an oral supplement or used in a topical oil approach. 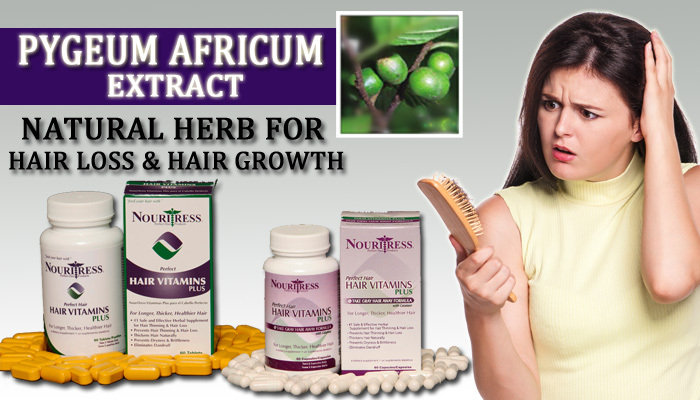 Applying a vitamin A solution to the scalp can aid in improving the health of the scalp and hair follicles. As you know Vitamin A, in addition to other vitamins such as Vitamin B, Vitamin C are beneficial to promoting overall better health which can help the body to work to prevent hair loss and encourage growth. Vitamin A however is a vitamin that focuses more closely on the condition of hair and nails. A body which is balanced has a steady supply of the vitamins and nutrients that help it function properly, including the scalp and hair follicles. Vitamin A is also crucial to the body as an anti-oxidant. The body needs anti-oxidants to have improved circulation function. Studies have shown healthy circulation is vital towards being able to prevent hair loss and eventually see hair regrowth. There are thousands of hair products on the market and choosing the right one for you can be mind boggling. How many times have you stood in the beauty supply store reading labels trying to figure out what will work best for you? Maybe you went to a particular beauty supply store to purchase a product that someone else suggested to you, so you knew exactly what you were looking for but you had the slightest idea how it would work for you. The truth is buying hair products are a hit and miss and you have to go through trail and era to figure out what will really work for you particular hair texture. You always have to give the products that you purchase a fair chance and using them one time and trashing them will never get you the results that you are seeking. African-American women are known for being product junkies and saying this means women tend to jump from one product to the next never giving a particular product time to work or should we say learning how to properly use the product correctly. 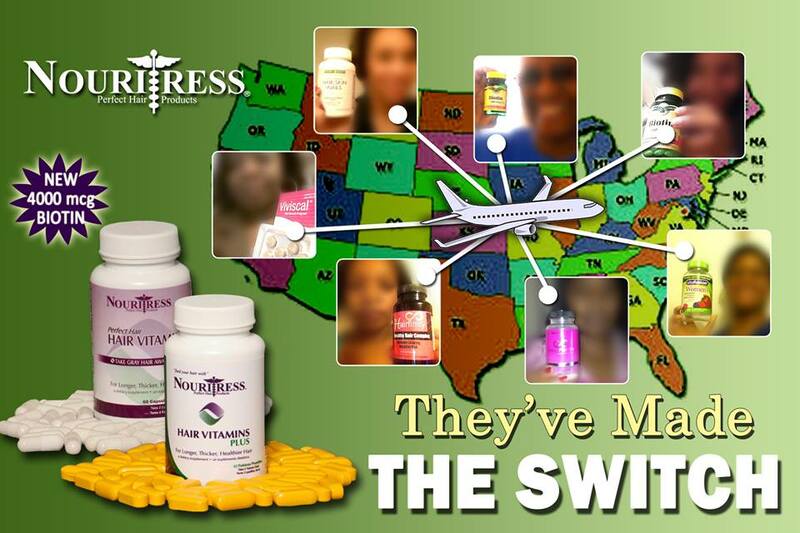 The same thing goes for hair vitamins we must understand that just because your co-worker told you that the NouriTress Hair Vitamins Plus worked on her in two weeks doesn’t mean that they will do the same for you! Our bodies are different and our hair is different so you cannot expect to have the same results that the next person had. We get tons of calls asking “how long will it take” but the truth is there really isn’t a definite answer simply because each person is different. If you’re not drinking water or eating right it may take you a little longer to see results than a person who eats healthy, exercises daily, and drinks plenty of water. Your diet plays a big role in your hair health and you can’t expect miraculous results from any product if you’re not getting the proper nutrients that are needed for healthy hair growth.